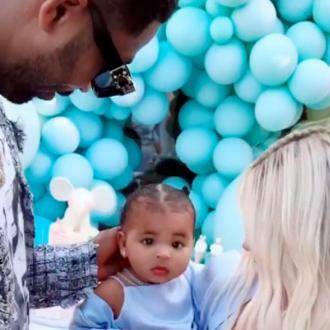 Khloe Kardashian is reportedly pregnant with her and Tristan Thompson's first child, according to sources. Khloe Kardashian is reportedly pregnant. The 33-year-old reality star is believed to be expecting her first child with her boyfriend Tristan Thompson, according to multiple sources to revealed the news to Us Weekly magazine. The 'Keeping Up with the Kardashians' star is the second member of the famous family to spark pregnancy rumours this month, as it was recently reported that her half-sister Kylie, 20, is expecting a baby girl with her boyfriend Travis Scott. Kylie's family - including Khloe, their mother Kris Jenner, and sisters Kim and Kourtney Kardashian, as well as Kendall Jenner - are said to be ''over the moon'' with the prospect of a new addition to the family. It comes after a source claimed Kylie - who previously dated rapper Tyga and spent time with his four-year-old son King Cairo - had ''always wanted'' to be a young mother. If all pregnancy rumours are to be believed, Khloe's pregnancy will mark the third Kardashian baby to be expected in 2018, as Kim Kardashian West and her husband Kanye West are supposedly expecting their third child via a surrogate mother, after Kim was advised against getting pregnant after complications with her two previous deliveries.